Matters.Huhuonline.com can say that it's easy to talk about something but harder to actually do it, if he has no problem handing over; he should have done so before he left Nigeria for Saudi Arabia three week ago. When President Umaru Yar`adua was hurriedly rushed out of Nigeria, his personal physician, Dr. Salisu Banye informed Nigerians he was suffering from Acute pericarditis, (an inflammatory condition of the coverings of the heart). Continuing he said “The medical review and tests undertaken at the hospital have confirmed the initial diagnosis that the President is indeed suffering from ACUTE PERICARDITIS.He is now receiving treatment for the ailment and is responding remarkably well". Unbeknownst to Nigerians, President Yar`adua did undergo surgery, at King Faisal Specialist Hospital and Research Centre in Jeddah, which implies that at some point he was administered anaesthesia (A drug given to the patient that have different effects with the overall aim of ensuring unconsciousness). According to a leading cardiologist who spoke to huhuonline.com on condition of anonymity at King Faisal Hospital, in medicine the word unconsciousness means “lacking normal sensory awareness of the environment; it is a remarkable alteration of an individual's mental state that involves complete or near-complete lack of responsiveness to people and other environmental stimuli”. 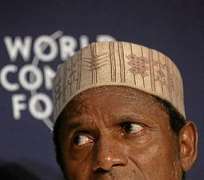 Huhuonline.com understands that Umaru Yar`adua was unconscious for sometime in Saudi Arabia, meaning at that point in time, Nigeria had no President to make decision that affects one hundred and fifty million of its citizens, as it is presumed that someone who is less than fully conscious cannot give consent to anything. Yet, Yar`adua and his sycophantic handlers, like Senator Abaji, undermined the Nigerian constitution and did not think it right to transfer power to the man next in line. Regardless of the media spin, President Yar`dua handlers put on this issue, huhuonline.com say that President Yar`adua kitchen cabinet will not voluntarily transfer power to Goodluck Jonathan. As Huhuonline previously published, for the past two years, this gang of four has treated the office of Vice president with contempt. In their estimation, Goodluck Jonathan is tantamount to a social prefect, who should only be seen and not heard, they see him as an outsider, as Obasanjo`s man. Ironically the Yar`adua/Goodluck ascension to the presidency was the handiwork of Obasanjo. Recall that Yar`adua had planned to return to polytechnic, when Obasanjo enlisted him into the presidency and handed him over to James Ibori. The gang huhuonline.com learnt have seized every opportunity to reiterate to President Yar`adua that Goodluck Jonathan must never be trusted. They have also cunningly created bad blood between Turai Yar`dua and Patience Goodluck, hence the continued refusal of President Yar`adua to hand over on two different occasions. Since Yar`adua assumed office, James Ibori using the Governor's forum, led by his friend and business partner Bukola Saraki has fought vehemently to wrestle the control of PDP from former President Obasanjo. Although according to a PDP insider, none of these men can even deliver their own ward in a free and fair election”, for fear of retribution, this gang of four has continued to encourage President Yar`adua to continuously undermine the Nigerian constitution. Bukola Saraki, huhuonline.com learnt seized the last cabinet reshuffle exercise to demonstrate to Goodluck Jonathan that he had President's ears, as he masterminded the removal of Mrs. Alison Madueke from the ministry of transport and installed his own candidate, who has since forged a business alliance with the monopolist Aliko Dangote. Recall that for twenty four years Aliko Dangote aspired to get on Forbes List of billionaires, and was only able to accomplish this life long ambition through the help of President Obasanjo. Little wonder, that the same Aliko who benefited enormously from Obasanjo, and even financed Obasanjo's third term bid, will now turn around to champion the “anti Goodluck for acting President” Campaign, simply because Obasanjo catalyzed his political ascension. This goes to show in politics the guiding principle is interest as there are no permanent friends or foes.